In the past few days, the transfer rumor mill for Premier League has been fixated on some big money signings. Betting websites suspended betting on Virgil van Dijk’s move to Liverpool and many Reds started celebrating their club’s record transfer on social media, before the Saints threw a spanner by complaining to Premier League about unauthorized approach to their defender from Liverpool’s side. Another potentially “done deal” is Mohamed Salah’s transfer to Liverpool. Reds are busy speculating at what stage the deal has reached and when will the Egyptian winger do his Melwood lean. While it would seem that only Liverpool are active in the transfer market, Arsenal too have been linked with a mega deal. I read somewhere that Arsenal are ready to offer £122 million to Monaco for Mbappe. This obviously is a ludicrous rumor as even though he came close to be sacked this summer, it is very unlikely that Arsene Wenger would splash that much money for one player, who has had one – admittedly great season. Among all these big money rumors, Arsenal actually announced a signing but it was a free transfer not a mega deal. On Tuesday, the Gunners announced that they had signed Schalke’s left-back/midfielder Sead Kolasinac on a free transfer and that the Bosnian will be a Gunner as soon as his contract in Germany runs out at the end of this month and as regulatory formalities are completed. It seems that Arsenal are looking to get a replacement for Monreal or Kieran Gibbs and on a first glance Kolasinac does seem like a good fit for the job. Let us take a detailed look at why or why not. Sead Kolasinac is 23 years old, considerably younger than Monreal (31) or Gibbs (27) and is adept at playing as a left full-back, left midfielder or a centre-back. He was also deployed as a defensive midfielder in the youth and reserve teams that he played for. He has been a regular for Schalke for the last two seasons, having appeared in 25 Bundesliga and 8 Europa League matches in 2016-17 and 23 Bundesliga and 6 Europa League matches in 2015-16. Having been born in Germany, he passed through the youth teams of Karlsruher SC, Hoffenheim and Stuttgart, before ending up in Schalke’s U19 team. He made his senior debut for Schalke in 2012-13 and has featured quite a lot for them in three out of the five seasons since then. A year later, in November 2013 he made his international debut for his parents’ home country (he is born in Germany to Bosnian parents) – Bosnia & Herzegovina in a 2-1 defeat to Argentina. In the 2014 world cup Kolasinac bagged an unwanted record of having conceded the fastest own-goal in world cup history when he scored an own-goal against Argentina in his side’s opening game. Kolasinac’s versatility across the defense and also on the left flank means that he should be able to fit into Arsenal, whether they play a 4-2-3-1 or 3-4-2-1. 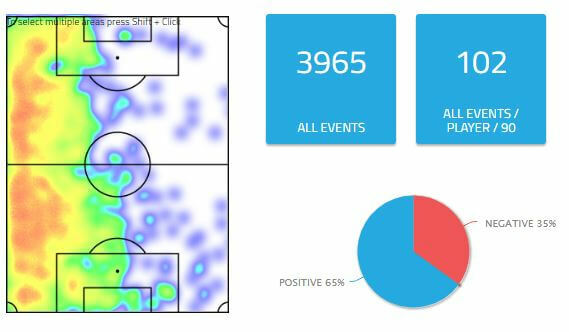 He is a busy player and contributes equally in attack as well as defense, as shown by his heatmap below. Moreover, although he appeared in 25 Bundesliga games in 2016-17 season, he averaged 82.8 minutes per appearance, much higher than Gibbs’ 64 minutes per appearance. 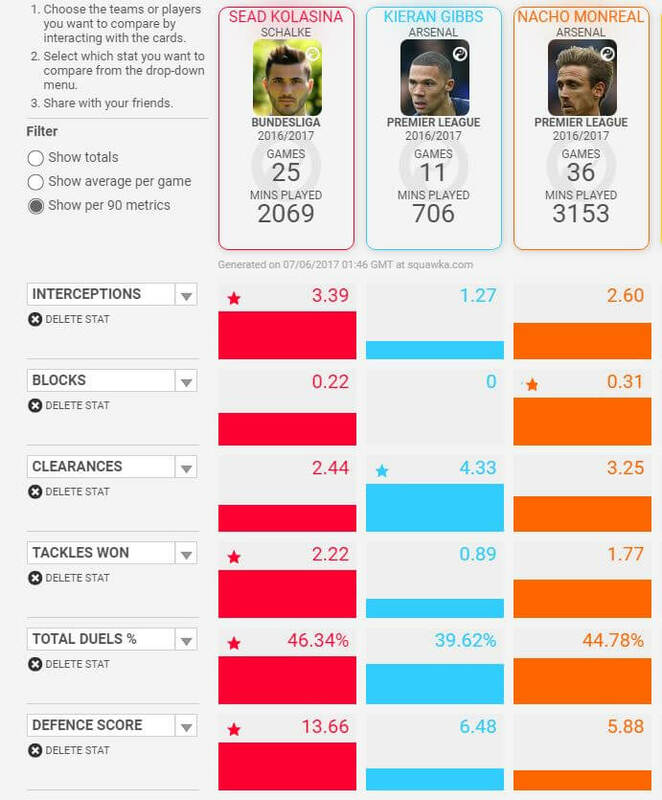 Defensively, he had a better season than both Gibbs and Monreal. As shown below, he was better than them in interceptions as well as tackling but trailed them a bit in blocks and clearances. He seems to be a bit more proactive defender than the Arsenal men he is likely to replace. He won a higher percentage of his duels than both of them and his defensive contribution was higher than both of them as well. Albeit in a different league, but he does seem like a better defender than any left-backs that Arsenal currently have. Whoscored notes that Kolasinac is weak in crossing and indeed, he has 29% success rate in crossing. His crosses seem to come from closer to the byline and perhaps the weak crossing is a function of crossing from and into well defended areas. But he makes up with a slightly higher number of crosses than the Arsenal men and it results in him completing at least one cross per 90 minutes. In comparison, Monreal completes 0.5 per 90 minutes. Also, if Arsenal keep playing Giroud as a sub or sell him, weak crossing is not going to show-up for their wingers or full-backs. His weak crossing is not a sign of any passing problems as he puts in 37.3 passes per 90 minutes with 83% accuracy, which is one area where is trails Monreal (45.1 passes with 90% accuracy). But he makes up with 3.7 long range passes per 90 minutes with 52% accuracy, whereas Monreal makes 2.7 long range passes every 90 minutes with 42% accuracy. So, if he is such a great player then why is Schalke allowing him to go out on a free. Why did they not find suitors earlier or why did they not offer a contract extension to him? The answer could lie in Kolasinac’s injury record. For a young defender, the list of his injuries on www.transfermarkt.com runs into two pages, although some of them seem like niggles which did not lead to any missed days or matches. His injury problems seem to have started in 2013-14 season, with him missing the start due to a torn muscle. He missed 42 days and 16 matches in that season. In total he was not available for 48 days in that season. His 2014-15 season also did not start well as he missed more than half of the season (175 days, 26 matches) – right from August to February and then was not available for another 24 days as he was training to get into the side. However, from 2015-16 he has not had any major injuries and whatever he has had has resulted in him missing only a few days and matches. In the last two seasons he has not been available for 24 days and has missed only 4 matches. That history perhaps answers why Schalke were unable to sell him in 2015 and why they do not want to continue with him as well. But who knows, perhaps Kolasinac has put his injury problems behind him and will be able to provide Arsenal with a solid left-back option for a long time. Wenger and Arsenal will be hoping so, because of their current options in that position, Monreal is 31 years old and Gibbs is clearly not as good as the incoming Bosnian. Kolasinac offers an improvement in defense and at least a similar record going forward, and all that for free. Last season Liverpool got Joel Matip for free from Bundesliga and he did not disappoint them. Arsene Wenger will be hoping that his free defender from Bundesliga will also not disappoint Arsenal. There is some wrong info in this text. Bosnia lost 2:1 to Argentina…not 2:0 (at the 2014 World Cup). True. Thanks for correcting. Updated the post. very same niche as yours and my users would truly benefit from some of the information you provide here. No please do not reproduce any of our articles. Categories: Arsenal, Arsenal (NN), EPL Index Featured Article, and EPL Index Statistical Comparisons.' 'Tags: Anfield, Arsenal, bosman, kieran gibbs, Kolasinac, Kolasinac stats, premier league, Schalke, Sead Kolasnic, Transfer News, and Virgil van Dijk. Will Jurgen Klopp splash the cash as clock ticks down on the January transfer window? What will Virgil van Dijk bring to Liverpool?